Magic: The Gathering continually offers new and exciting worlds for us to visit, and more importantly, new cards from those worlds for us to play with. Releasing later this month, Ixalan is a Magic set that’s a bit of a grab bag. It’s a tropical paradise. It has dinosaurs, and those dinosaurs have feathers. It also has conquistadors who are vampires (which is a pretty literalized metaphor if you ask me). There are also pirates. A decade ago, one could not talk about pirates without being caught up in the embarrassing nerd parade that was the combination of pirates and ninjas. Talk Like A Pirate Day is the most tragically uncool thing ever invented, and there was a time when enthusiastic love for pirates was being funneled into the world at an unsustainable rate. Pirates became bad. Ixalan is part of the careful resuscitation of the pirate image as “cool” rather than “awful” (Assassin’s Creed IV: Black Flag is also part of this international effort), and thankfully I get to do my own small part by revealing some new pirates to you. 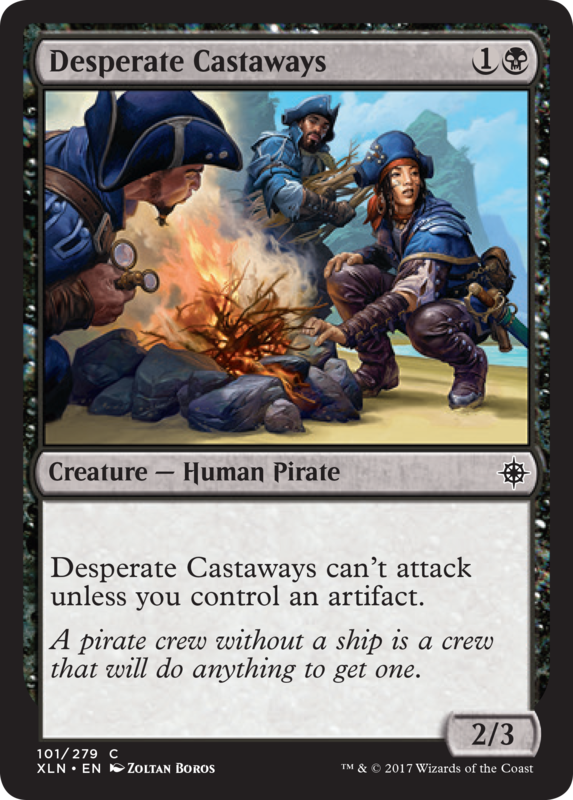 I’m always incredibly happy to reveal the bread-and-butter cards for Magic, and these pirates are all-star commons that are going to make big moves in any limited environment. Brazen Buccaneers is going to either draw you a land or come in as a beefy haste creature, and it’s the perfect top-end for an aggressive deck that wants to smooth out its draws for consistency. Desperate Castaways is a great early blocker for a control gameplan, and it’s even better if you equip it up and start swinging away. Skulduggery, one of the best card names in history, is going to make a lot of people stop and think before attacking or blocking. 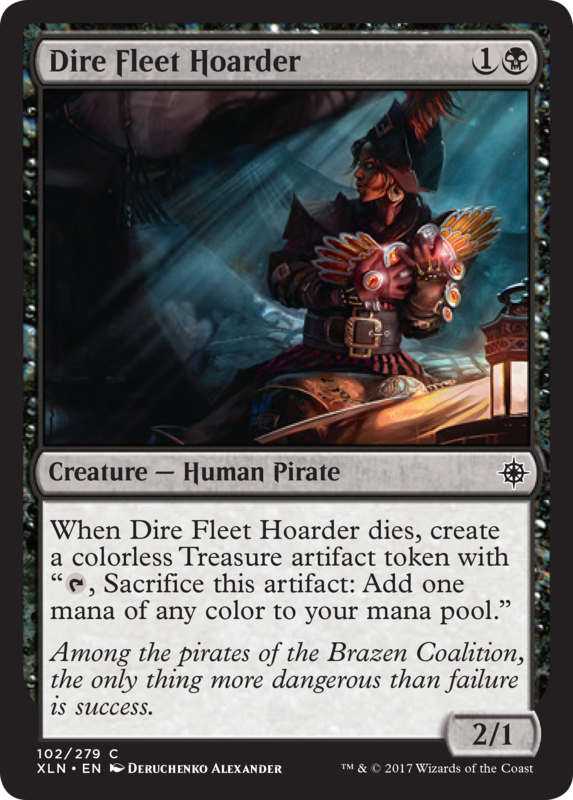 Finally, Dire Fleet Hoarder is just waiting to die, drop her treasure, and help you power out your big threat. 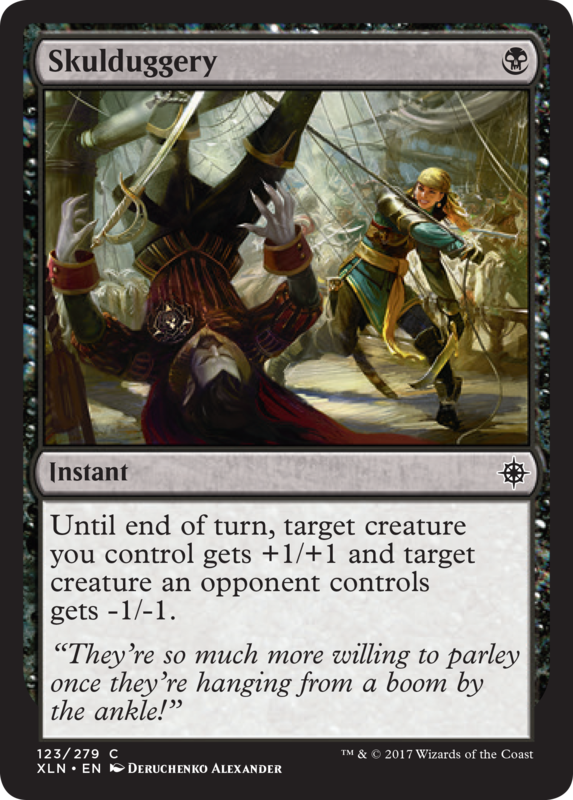 I am super exciting to play any of these cards in Ixalan prerelease (or beyond), and I hope that they all enable your pirate-themed victories in coming months. Please, for the love of god, do not yell “arrrr!” when you play with these cards, though. Pirates can only take so many hits to their integrity. Cameron Kunzelman tweets at @ckunzelman and writes about games at thiscageisworms.com. His latest game, Epanalepsis, was released last year. It’s available on Steam.